Intra-joint trauma often accompanies cartilage damage, as one of the main reasons of osteoarthritis, which often induce severe pain and limited joint function in the final stage. Because of the poor regenerative capacity, cartilage repair has been on the top list of regenerative medicine from decades ago. Recently, the researches of cartilage regeneration are mainly focused on the development of novel scaffolds, which can provide spatial frame and logistic template for stem cells, other progenitor cells, or chondrocytes to proliferate or differentiate into cartilage-like tissues. Among the dazzling scaffolds, chitosan-based systems, including physical hydrogels, chemically cross-linked hydrogels, or porous scaffolds, show great potential in cartilage tissue regeneration. 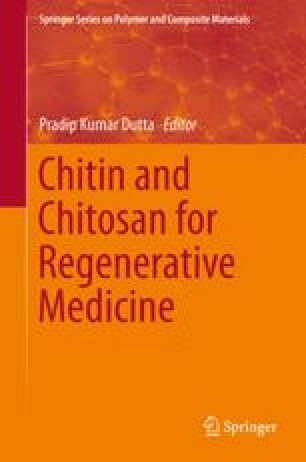 Chitosan possesses superior characteristics, such as biocompatibility, biodegradability, bioabsorbability, low immunogenicity, and intrinsic antibacterial nature, for potential applications in tissue engineering. Specially, the chemical structure of chitosan is similar with various glycosaminoglycans (GAGs), which play important roles in chondrocyte morphology modulation, differentiation, and function. In addition, appropriate mechanical properties and porosity, excellent cell adhesion, and even control release of functional growth factors are achieved in chitosan-based scaffolds. In this chapter, the advancements of different types of chitosan-based scaffolds for cartilage regeneration are systemically summarized, and the future directions are predicted. This work was financially supported by the National Natural Science Foundation of China (Nos. 51303174, 51273196, 51203153, 51233004, 51390484, and 51321062), the Scientific Development Program of Jilin Province (Nos. 20140520050JH and 20140309005GX), and the Science and Technology Planning Project of Changchun City (No. 14KG045).